The WID-JPMorgan Chase & Co. Conference Accessibility Initiative launched in 2016. In 2019, we are excited for the fourth year of this pioneering work. For this effort, WID, in partnership with JPMorgan Chase, is actively striving to make community development and policy conferences more accessible to and inclusive of people with disabilities. Across America, convenings of civil rights and community development organizations help to set the economic opportunity agenda. Unless the conferences fully integrate disability access issues into their content–and people with disabilities are present–the needs and perspectives of the disability community will be largely left out of the discussion. Through disability accommodations, scholarships, and training, WID and JPMorgan Chase continue to make conference accessibility and economic opportunity more inclusive to the 54 million Americans with disabilities. Read the press release for information about the kickoff in March 2016. To read more about each year of the initiative and see photos from each conference, click on the image links below. Read about our primary captioner, Deanna Baker, who ensured thousands of people experienced open captioning for the first time in 2016 and who will continue her great work with us as the initiative proceeds. 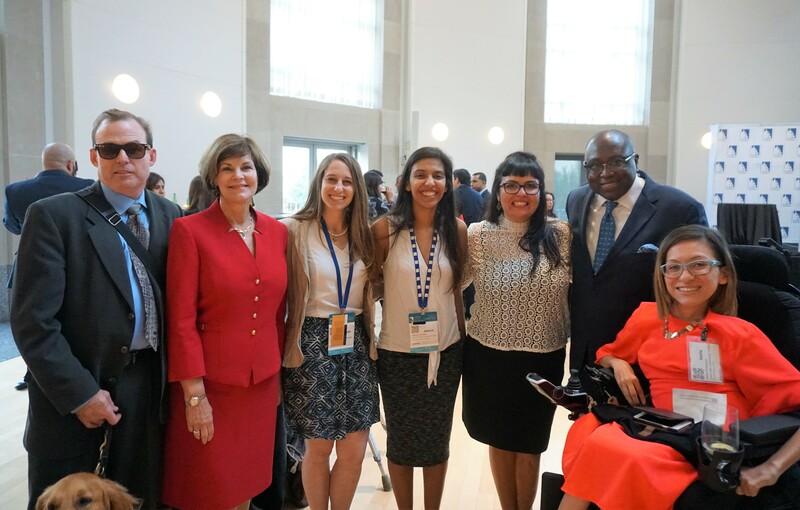 Would you like to be a trailblazer for disability inclusion at some of the most influential civil rights and community development conferences in America? Would you like to do this while being supported by a generous scholarship and a team of fellow disability advocates? If so, apply to be a 2019 Disability Ambassador today! Questions? Email us at conferenceaccess@wid.org.